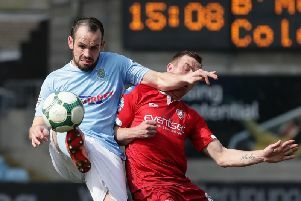 Ballymena United manager David Jeffrey was a happy man after his side's 4-1 Danske Bank Premieship win against Ards at the weekend. The result means the Sky Blues sit second in the league table at the end of January thanks to two goals from Adam Lecky, one from Cathair Friel and an Ards own goal. And Jeffrey is happy with the way this season has gone to date but he wants more.